The world’s leader in advanced adhesives for over 50 years and the UK’s No.1 brand. There is a Loctite product to suit every repair need, delivering strength and reliability each and every time. Our liquid Super Glue range contains water resistant and dishwasher resistant formulas, whilst our Power Flex gel glues are rubber infused to give extra strong, flexible bonds. 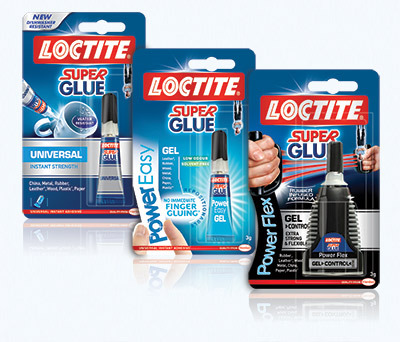 Meanwhile, the Loctite specialist glues expertly bond hard-to-mend materials such as glass and plastics.